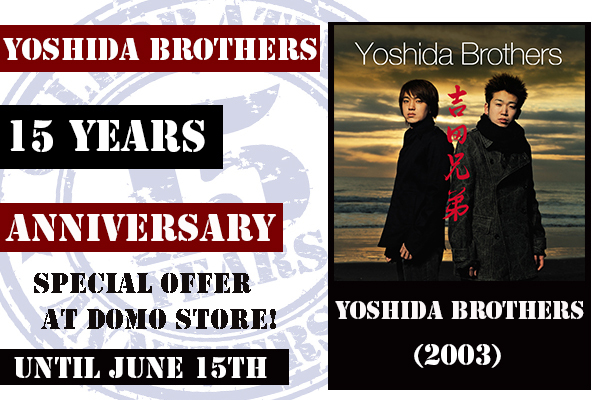 Yoshida Brothers and Domo Records would like to thank all of Yoshida Brothers fans for your support during their musical journey in these 15 years. To celebrate their 15th Anniversary, we offer a special promotion on each album every 15 days. Yoshida Brothers’ US debut album! This album contains a traditional song “Tsugaru Jyongara Bushi” in both Kenichi and Ryoichiro version as well as their original songs. By adding various type of instruments such as Drum, Guitar, Base and Violin to their sound, this album created another sensation in traditional Japanese music. $18.98 => $10.98 ($8 OFF!!!) until June 15th!! Again, thank you to all those who have supported Yoshida Brothers. 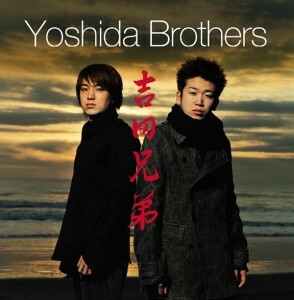 Please follow Yoshida Brothers SNS pages! This entry was posted in Yoshida Brothers and tagged 15th Anniversary, domo records, japanese, Self Title, Shamisen, Soulful, traditional, tsugaru, Tsugaru Jyongara Bushi, World music, Yoshida Brothers. Bookmark the permalink.